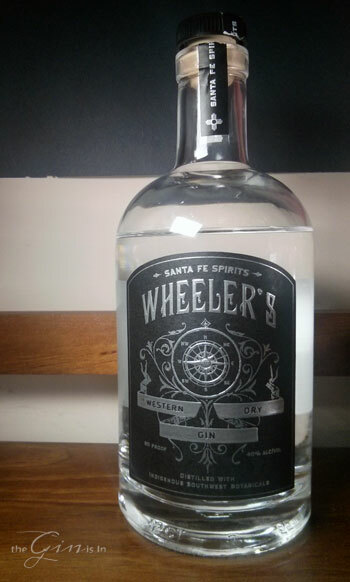 Wheeler’s Western Dry Gin from Santa Fe Spirits captures the essence of place through the use of many botanicals native to New Mexico, and of importance to New Mexico heritage. For example, the Osha root [known to Native peoples’ as Bear Root, so-called as legend says it was discovered by observing a bear consuming it] is a local medicine, historically used for aches. Then take the Cholla cactus, whose blossoms are reputed to have a faintly “cucumber” like flavor. Throw in sage [the aroma of the desert] and juniper, each individually distilled, then combined, and you have a distinctly New Mexican gin. Vividly and powerfully aromatic, at even first blush, bright sage, with a wet sagebrush after a spring rain aroma, leading you into some deeper juniper notes, with earthy depth in the lower notes. Very bright and inviting, though it could easily be mixed up from aroma along with Art in the Age’s Sage Spirit, but more on that later. The palate of Wheeler’s Western Dry Gin offers a significantly more complex bouquet or notes to unravel. At first, a touch of a floral lift, with a stab of sage oil, the mid-notes are richly complex with at first vegetal, crisp, green notes, then some sweeter, spicier hints. You get some crisp, recognizable juniper here, before a hint of citrusy sweetness giving way to a long sage note that dominates the finish. Crisp and bright. Although there’s no doubt that sage is the leading note here, the other botanicals compliment and round it out nicely. I decided to try Wheeler’s Gin in a side by side neat taste test with Art in the Age’s Sage spirit. Since I had the latter for a project I was working on around botanical spirits, it was worth comparing. While both compliment the sage with other botanical notes, it’s interesting how the fennel and rosemary lift in Sage, largely dominant in the finish, parallel similar balance and complexity in the gin. Whereas Sage has stronger Sage note up front and in the middle, Wheeler’s juniper, angelica, and coriander offer a spicier, definitely gin like, but more balanced middle note. I quite like both spirits, but side-by-side, it’s very clear which one is a gin, and it also helps highlight the way some of the more traditional gin compliments can be used to color in the lower notes of a spirit. Anyway, let’s get back to the cocktails. At first, we mixed it up in a Dunhill’s Special. For those of you unfamiliar with this century old cocktail, it’s composed of equal parts Vermouth, Sherry and Gin. Add a dash of curacao, stir and strain. The nose was sweet sherry and brown sugar. The palate was wonderful and complex: safe up front, citrus in the middle, ripe grapes, cooked cherries and then lemon as the low notes unfolded with a touch of creamy richness. The sage note was lovely, and very complimentary. We then put Wheeler’s Western Dry Gin to test in a 4:1 Martini. The Sage works beautifully side by side, adding a badly needed bright list to the darker herbal characters of the Vermouth. Hardly traditional, but very good as its own sort of cocktail. We then tried it in a Gin and Tonic with Liber and Co.’s Tonic Syrup . Surprisingly quiet at first, with cinnamon, nutmeg, sage and cloves in a bright spicy flourish. It has that nice bright sage-note quality, though this time complimenting it with a fresh floral lift, enhanced by the tart sweetness of the syrup. Finally, we tried Wheeler’s Gin in a Gimlet. A little bit of the earthy spice complimented the acidic notes from the lime. There was a tart, puckering, citric acid punch, with sage again dominant on the finish. Quite nice.